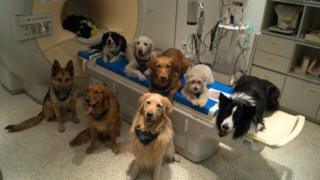 Some of the dogs who took part in the research, sitting on the MRI scanner. Ever wondered if your dog can REALLY understand what you are saying? Researchers from the Eötvös Loránd University in Hungary have found that dogs can recognise certain words and even tell the difference between how the words are being said. They found that the animals can tell if the words are positive like or negative and can understand the tone of voice used to say them. One of the dogs taking part in the research on the MRI Scanner table. 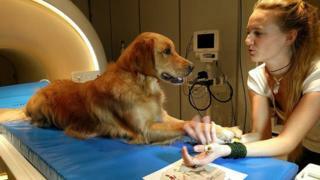 They trained a group of dogs to lie really still in an MRI scanner, which is a bit like an x-ray for your brain. It told scientists how the dog reacted to different things by measuring which part of their brain was used in response the test. The scientists played the dogs recordings of words said in a happy or a normal tone of voice to see how they would react. By looking at the MRI scans the scientists found that the dogs recognised certain words, and could tell the difference between how the words were being said, in the same way that humans do. When the dog was played a recording of a positive message said in a happy voice the scans showed the dogs processed that information in the part of the brain that deals with rewards and happy feelings. One of the researchers Attila Andics explained that: "This shows… that dogs not only separate what we say from how we say it, but also that they can combine the two for a correct interpretation of what those words really meant." What's the best way to stroke a dog?